A4 Size 7.3 x 8.9 in. (185 x 224 mm) 8.3 x 11.7 in. A4 Mounted 7.3 x 8.9 in. (185 x 224 mm) 11 x 14 in. (304 x 372 mm) 13 x 19 in. This intricate composition depicting the ‘Wooden Mask of Akasha Bhairava’ was painted for me by Samundra in 2008, and is based upon an earlier black-and-white composition of the Mask of Bhairava by Gyankar Bajracharya, which also appears in this gallery. But while Gyankar’s two-dimensional version was painted in black fabric paint on white cotton, this monochrome version by Samundra was rendered in oil pigments on a square piece of wooden composition board and skilfully shaded to resemble a three-dimensional carved wooden mask of this powerful tantric deity. Many of the deities that appear in these two compositions are hard to identify, and several years before his death I asked Gyankar to help me with this. However, he said he'd created this composition from its description in an old Newar text that he'd borrowed and no longer had access to. And with Gyankar being a vajracharya or ‘priest’ of the important Siddhi Lakshmi temple, who possessed a unique knowledge of both the Buddhist and Hindu deities of the Newar pantheon, there is nothing further I can currently do about this. Bhairav or Bhairava, meaning the ‘Terrifying", is the wrathful aspect of Shiva-Mahadeva, who manifests in eight principal forms within the Newar tantric tradition. These Eight Bhairava's (Skt. astabhairava) serve as guardians of a sacred city’s eight directions, and frequently appear with their consorts or female counterparts, who are known as the astamatrika or ‘Eight Mother’ goddesses. This wrathful mask is related to the the two main forms in which the wrathful head of Akash Bhairav (Akasha Bhairava) is worshipped in the Kathmandu Valley. The first being the large bronze mask of Akash Bhairav that is housed on the second floor of his temple in Indra Chowk, Kathmandu City, which along with a similar and nearby mask of ‘White’ or Seto Bhairav is worshiped in a great autumnal Newar festival known as Indra Jatra. While the second and more secret mask of Akash Bhairav is enshrined in a wooden box at his temple in Taumadi Square in Bhaktapur, and worshipped in spring during his chariot-drawn New Year festival, known as Bisket. This small Akash Bhairav temple was, until the recent earthquake, overshadowed by the massive five-storey Nyatapola Temple, which was built in 1702 to house the image of the secret tantric goddess Siddhi Lakshmi. She is the only deity powerful enough to control the wrath of Akash Bhairav, who at that time was wreaking havoc in Bhaktapur City. 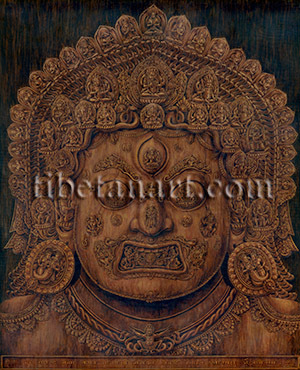 The Sanskrit termAkash means ‘sky or space’, and the three bulging eyes of Akash Bhairav's mask fortunately gaze upward towards the sky, since his terrifying eyes are said to destroy everything upon which his baleful gaze falls. Having been ‘tamed’ by Siddhi Lakshmi, Akash Bhairava would later gain fame as the ‘sky-gazing’ patron Newar deity of Royal Nepal Airlines. The pupils of Bhairava's three bulging eyes bear the images of white Chandra, the Moon-god (right eye); red Surya or Aditya, the Sun-god (left eye); and the mahavidya or ‘great-knowledge’ goddess Tripura Sundari (third eye). Chandra rides upon a chariot drawn by seven swans or geese, while Surya or Aditya’s chariot is drawn by seven horses. They both hold lotuses in the two hands and are flanked by two attendants holding drawn bows and arrows. Tripura Sundari is golden and sits on a lotus holding the attributes of an iron hook and noose, an arrow and bow in her four hands. Two fiery naga-serpents and boar-and bear-headed deities form Bhairava’s eyebrows, while the fierce serpent-devouring head of Cheppu or kirtimukha appears on the bridge of his nose with a peaceful four-armed deity standing below. Within Bhairav’s four-fanged and gaping mouth is a triangular yantra with an inner six-pointed star, a naga and nagini, and two semi-wrathful guardian-deities. The facial hair encircling his mouth depicts two symmetrical peacocks standing upon two makara or ‘water monsters’, with all four creatures having long ornate tails. A peaceful four-armed goddess and a wrathful two-armed male protector adorn Bhairav’s cheeks, with the tantric symbols of a serpent, bell, club, vajra, three peacock feathers, bowl of jewels, sword and trident appearing in roundels upon his face. Fierce two-armed aspects of Bhairava squat on lotuses within each of his ears, and the embracing serpentine forms of a naga and nagini entwine within the lotus circles of his earrings. At the bottom of this painting is an inscription that reads: Nama Maha Raudra Gagana Vajracharya Shri Shri Shri Prachandra Halahala Ugra Maha Akasha Bhairava Nama. Which translates as: Salutations to the Great Terrifying and Space-like Effulgent One, to the Threefold Most Excellent, Ferocious, Poisonous and Violent One, to the Great Akasha Bhairava, Salutations.